The Suit Up &amp; Show Up event will give new suits, shirts and shoes to 90 young at-risk Tampa teens. TAMPA, Fla. — It is time to suit up for 90 at-risk male teens in Tampa. The boys and young men, who are either in high school or college, will be fitted for free suits, shirts and shoes on Friday as part of a minority-empowerment event called Suit Up & Show Up. “For a lot of these young men, it will be their first suit,” says program coordinator David Jones of the Corporation to Develop Communitie s (CDC) of Tampa. This is the sixth year for Suit Up & Show Up , which is being held at the Ybor City campus of Hillsborough Community College . 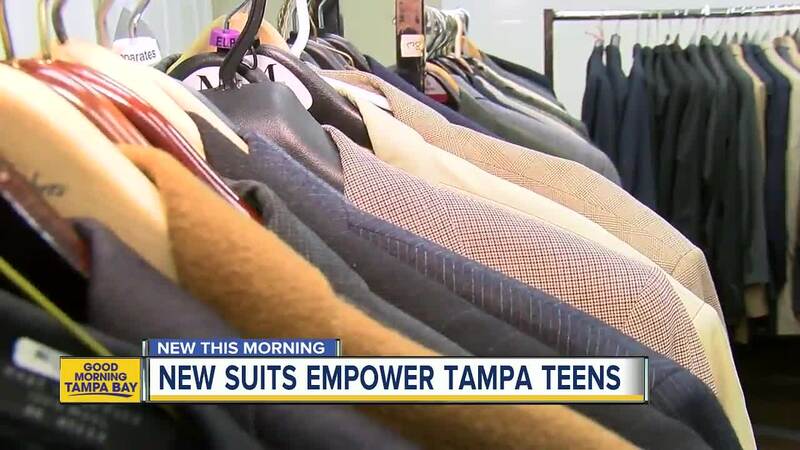 The Tampa teens will get free clothes donated by such places as Men’s Wearhouse for job interviews. They will also receive daylong counseling and leadership from prominent figures in the community. “How do I suit up for the roles I’ll face in life, like being a father, being a community advocate,” says Jones. Many of the volunteers and participating vendors are using the event to honor Martin Luther King’s Day of Service. The program was inspired by John Singleton, a 17-year-old bystander killed during a shoot-out in Tampa in 2011. CDC of Tampa CEO Ernest Coney Jr. bought the funereal suit for Singleton — which also happened to be his very first suit. Determined a young man’s first suit be a positive uplifting experience, Coney started Suit Up & Show Up for at-risk area youth.